The New York Yankees have added elite reliever Adam Ottavino from the Colorado Rockies after signing a three-year, $27-million deal with the bombers to fortify an already stacked bullpen. Born in Manhattan and raised in Brooklyn, Ottavino was regarded as one of the best free agent relief pitchers available in the offseason. 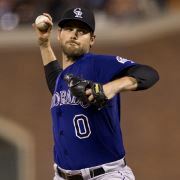 The 33-year-old right-hander had an outstanding 2018 season with the Rockies. In 77.2 innings he pitched to 2.43 ERA while holding opposing hitters to a .158 batting average and amassing a career-high 112 strikeouts, the fourth most by any major league reliever. Furthermore, his 12.98 strikeouts per nine innings pitched ranked third in the National League among relief pitchers who tossed at least 50 innings. Even more impressive were Ottavino’s numbers at home. At Coors Field, an extremely hitter-friendly park, Ottavino had 34 appearances posting a 2.10 ERA and a .124 opponents’ batting average. Throughout his career, Ottavino has struck out 464 batters in 413 innings pitched. The Yankees are his third team in the majors after stints with the St. Louis Cardinals and the Rockies. Ottavino, who owns a 3.68 career ERA, features one of the best sliders in the game and will look to continue his late-inning dominance with the Yankees in the Bronx. Ottavino is the third player from the Rockies to sign with the Yankees this offseason. Shortstop Troy Tulowitzki, a five-time All-Star and two-time Gold Glove winner, signed with the Yankees on January 4; while second baseman DJ LeMahieu, a two-time All-Star and three-time Gold Glove winner, joined the Bombers on January 14.